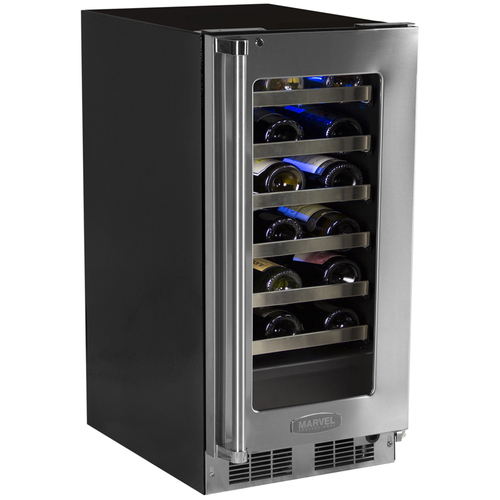 Designed with a contemporary look and high tech features, the Marvel 15 Built-In Pro Single Zone Wine Cellar with Lock (MP15WSG3) keeps every bottle in prime condition. This wine cellar features smooth gliding racks that prevent agitation and hold up to 24 bottles of your favorite vino. Intuit controls offer precise temperatures while the industry leading Dynamic Cooling Technology let you quickly chill bottles when needed. Style follows function with a smart modern design and stainless steel finish.Intuit control: MARVEL Intuit integrated controls provide precise temperature management from 40 degreeF to 65 degreeF.Alarms: This wine cellar alerts you to sustained temperature fluctuations, power interruption, or if the door is left ajar with audible and visual alarms.UV protection: Tinted, UV-resistant dual pane glass door protects wine from damaging ultraviolet light.Efficient: This wine cellar is up to two times more efficient than leading competitors.Vacation/Sabbath mode: The Vacation/Sabbath mode conserves energy during times when the unit is not in use and complies with Star-K requirements. 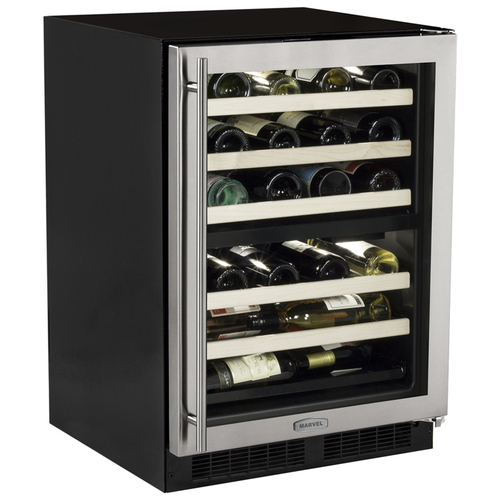 Keep your favorite bottles ready for relaxed evenings with the Marvel 15 Built-In Single Zone Wine Cellar (ML15WSG1). 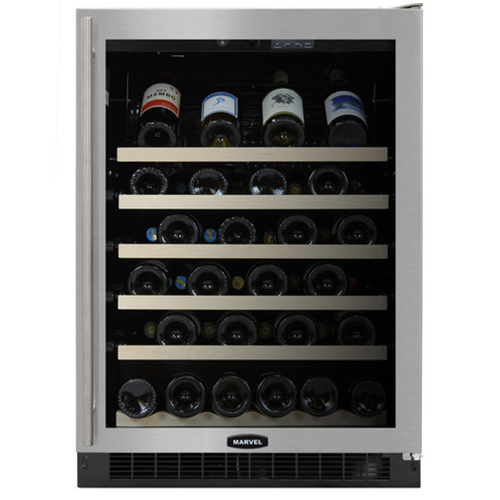 A smooth gliding rack system is able to store up to 24 of your favorite varieties of wine. 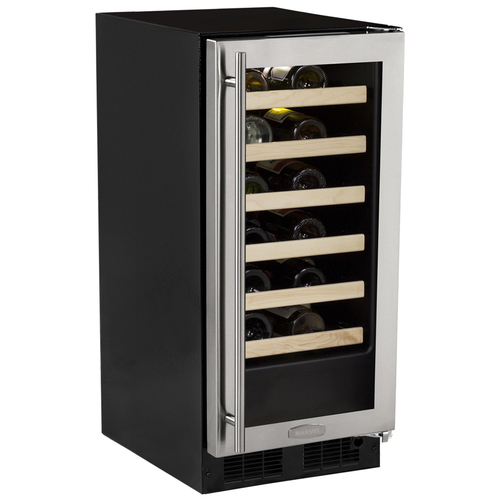 The Dynamic Cooling Technology leads the industry in temperature stability and also provides rapid cool-down to quickly chill wines for easy drinking. Its modern style and high-tech storage features maintain a look and functionality that enhances any kitchen, home bar, or wine cellar.Intuit control: MARVEL Intuit integrated controls provide precise temperature management from 40 degreeF to 65 degreeF.Alarms: This refrigerator alerts you to sustained temperature fluctuations, power interruption, or if the door is left ajar with audible and visual alarms.UV protection: Tinted, UV-resistant dual pane glass door protects wine from damaging ultraviolet light.Sabbath/Vacation mode: The Vacation/Sabbath mode conserves energy during times when the unit is not in use and complies with Star-K requirements.Efficient: This wine cellar is up to two times more efficient than leading competitors. 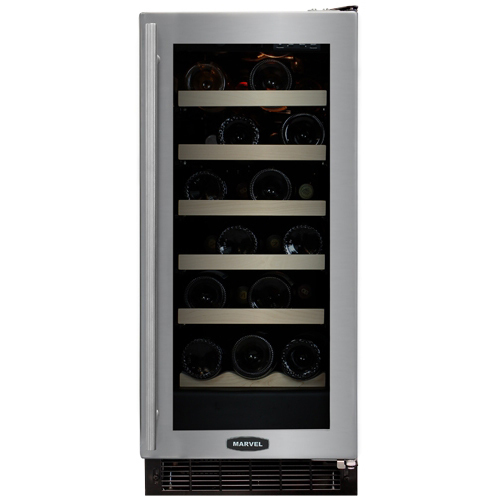 Beautifully melding designer style and high-tech functionality, the Marvel 15 Built-In Wine Cellar (30WCM-BS-G) is a must have for any wine enthusiast. Behind the insulated glass door you'll find storage for up to 23 bottles of your favorite vino with smooth gliding bottle drawers. The MicroSentry system alerts you with a series of audible and visual alarms if settings are inadvertently changed or if the door is left ajar. A digital display makes it easy to adjust storage conditions. A stylish design showcases maple shelf fronts, a contemporary handle, interior illumination, and a striking finish.Prime control: MARVEL Prime controls allow you to set cabinet temperature from 40 degreeF to 65 degreeF.MicroSentry: Marvel's MicroSentry refrigeration monitor controls the refrigeration system's performance with visual and audible alarm signals if the temperature goes above or below the set point for an extended time or if a door is left ajar.UV protection: Tinted, UV-resistant dual pane glass door protects wine from damaging ultraviolet light.Door close: Close Door Assist System gently and automatically closes the door.Custom look: Natural maple shelf fronts are stainable to match cabinetry.Vacation or Sabbath mode Conserves energy during times when unit is not in use and complies with Star-K requirements. The Marvel 24 Built-In Dual Zone Wine Cellar (ML24WDG2) provides a stylish look and modern design made to keep wines at their peak. This wine cellar holds up to 40 bottles in two independent cooling zones to store a variety of wine in their ideal conditions. 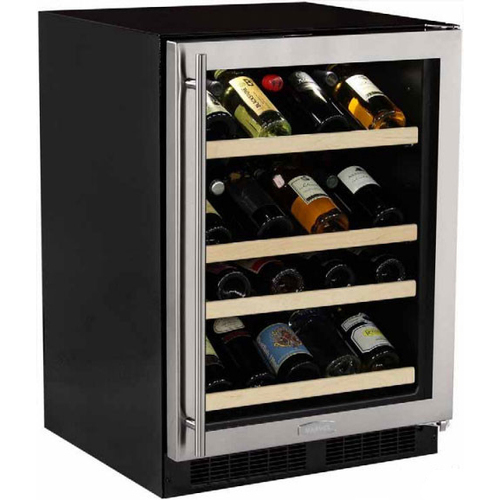 Gliding racks and a Vibration Neutralization System ensures that your wine isn't agitated by unnecessary movement. All of these smart functions are wrapped in contemporary style with stainless steel trim and maple shelf fronts.Intuit control: MARVEL Intuit integrated controls provide precise temperature management from 55 degreeF to 62 degreeF in the upper zone and 45 degreeF to 55 degreeF in the lower.Alarms: This refrigerator alerts you to sustained temperature fluctuations, power interruption, or if the door is left ajar with audible and visual alarms.Door close: Close Door Assist System gently and automatically closes the door.UV protection:Tinted, UV-resistant dual pane glass door protects wine from damaging ultraviolet light.Efficient: This wine cellar is up to two times more efficient than leading competitors.Custom look: Natural maple shelf fronts are stainable to match cabinetry.Sabbath/Vacation mode: The Vacation/Sabbath mode conserves energy during times when the unit is not in use and complies with Star-K requirements. Let the Marvel 24 Built-In Gallery Single Zone Wine Cellar (ML24WSG1) maintain your prized wine collection with industry leading performance. 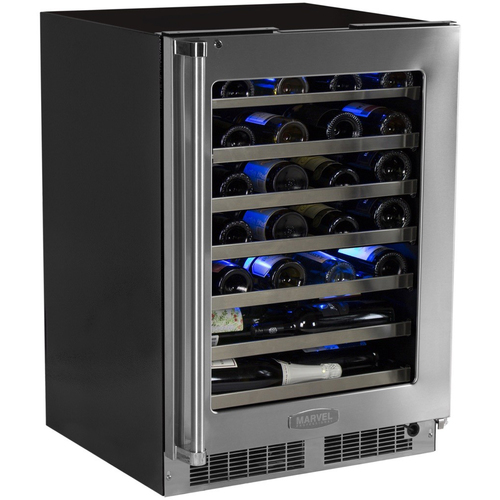 Able to hold up to 27 bottles of your favorite varietals, this wine cellar is easily adjusted for precise temperatures via Intuit integrated control system. A UV-resistant glass door protects your wine from harmful sun rays while giving this cooler a modern appeal that enhances any setting.Intuit control: MARVEL Intuit integrated controls provide precise temperature management from 55 degreeF to 62 degreeF in the upper zone and 45 degreeF to 55 degreeF in the lower.Door alarm: Audible and visual alarms signal when door is left ajar to protect wine integrity and energy use.Door close: Close Door Assist System gently and automatically closes the door.UV protection:Tinted, UV-resistant dual pane glass door protects wine from damaging ultraviolet light.Efficient: This wine cellar is up to two times more efficient than leading competitors.Custom look: Natural maple shelf fronts are stainable to match cabinetry.Sabbath/Vacation mode: The Vacation/Sabbath mode conserves energy during times when the unit is not in use and complies with Star-K requirements. The Marvel 24 Built-In High-Efficiency Single Zone Wine Cellar (ML24WSG2) provides the ideal conditions for proper wine storage. Holding up to 45 bottles, this wine cellar leads the industry with the temperature stability of the Dynamic Cooling System. It even puts your collection on beautiful display with a gallery display rack and UV-resistant insulated glass door. You can easily adjust temperature with the precision of the Intuit integrated controls.Intuit control: MARVEL Intuit integrated controls provide precise temperature management from 40 degreeF to 65 degreeF.Alarms: This wine cellar alerts you to sustained temperature fluctuations, power interruption, or if the door is left ajar with audible and visual alarms.UV protection: Tinted, UV-resistant dual pane glass door protects wine from damaging ultraviolet light.Door close: The Close Door Assist System gently and automatically closes the door.Custom look: Natural maple shelf fronts are stainable to match cabinetry.Efficient: This wine cellar is up to two times more efficient than leading competitors.Vacation/Sabbath mode: The Vacation/Sabbath mode conserves energy during times when the unit is not in use and complies with Star-K requirements. 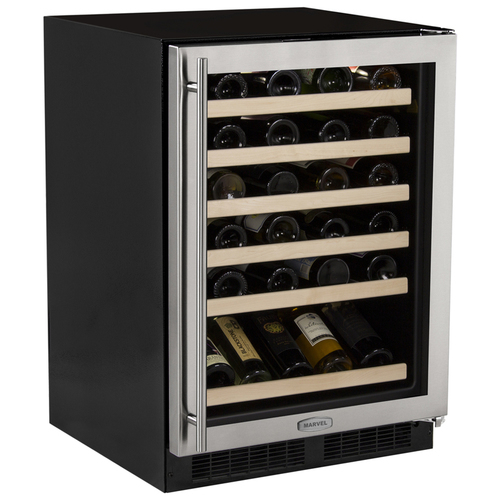 Diversify your wine collection with help from the Marvel 24 Built-In Pro Dual Zone Wine Cellar with Lock (MP24WDG4). 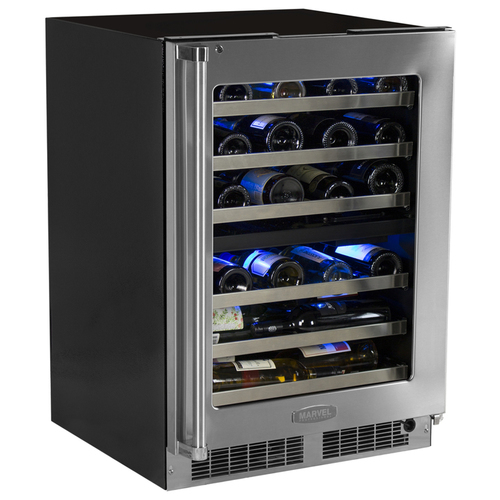 This wine cellar provides true dual zone cooling with independently controlled cooling zones for red and white wines. Cradling each bottle, the heavy duty racks glide smoothly without adding excess agitation. A UV-resistant insulated glass door puts your collection on beautiful display for all to enjoy.Intuit control: MARVEL Intuit integrated controls provide precise temperature management from 55 degreeF to 62 degreeF in the upper zone and 45 degreeF to 55 degreeF in the lower.Alarms: This wine cellar alerts you to sustained temperature fluctuations, power interruption, or if the door is left ajar with audible and visual alarms.UV protection: Tinted, UV-resistant dual pane glass door protects wine from damaging ultraviolet light.Efficient: This wine cellar is up to two times more efficient than leading competitors.Vacation/Sabbath mode: The Vacation/Sabbath mode conserves energy during times when the unit is not in use and complies with Star-K requirements. Smart function and style make the Marvel 24 Built-In Pro Single Zone Wine Cellar with Lock (MP24WSG4) an ideal home for your growing wine collection. This wine cellar can hold up to 48 bottles of wine on gliding racks that cradle each bottle for proper stability. Not only putting your collection on stunning display, the glass door holds temperature and even protects against harmful UV light.Intuit control: MARVEL Intuit integrated controls provide precise temperature management from 40 degreeF to 65 degreeF.Alarms: This wine cellar alerts you to sustained temperature fluctuations, power interruption, or if the door is left ajar with audible and visual alarms.UV protection: Tinted, UV-resistant dual pane glass door protects wine from damaging ultraviolet light.Efficient: This wine cellar is up to two times more efficient than leading competitors.Vacation/Sabbath mode: The Vacation/Sabbath mode conserves energy during times when the unit is not in use and complies with Star-K requirements.